WPI can deliver “make-exact” fiber assemblies using proprietary qualified fiber and designed by in-house optical engineering. In addition WPI customers can count on the superior performance of WPI spectroscopy products and application knowledge to provide them reliable data to make new discoveries; whether it is one assembly, ten thousand assemblies or a complete fiber optic sensing system. WPI's QVLUX-series fiber has been engineered to not only provide superior transmission in the UV but have excellent consistency over length.This makes QVLUX a perfect choice for critical measurements or where "plug-and-play" capaiblity is required without having to recalibrate after a fiber assembly change. Standard silica fiber exhibits a "solarization impact" when transmitting light in the UV below ~280nm. Over time, depending on the optically transmitted power, the fiber's abiltiy to transmit UV light drops off. Our QVLUX fiber offers superior resistance to solarization, lowest basic attenuation at 200nm (<1 dB/m) and the lowest solarization at 214 nm on the market. WPI is the only companyoffering DIN 58145:2018-01 certified low solarization UV fibers and assemblies. Our QVLUX fiber has been engineered to not only provide superior transmission in the UV but have excellent consistency over length. This makes QVLUX a perfect choice for critical measurements or where “plug-and-play” capability is required without having to recalibrate after a fiber assembly change. Our QVLUX fiber offers superior resistance to solarization, lowest basic attenuation at 200nm (<1 dB/m) and the lowest solarization at 214nm on the market. 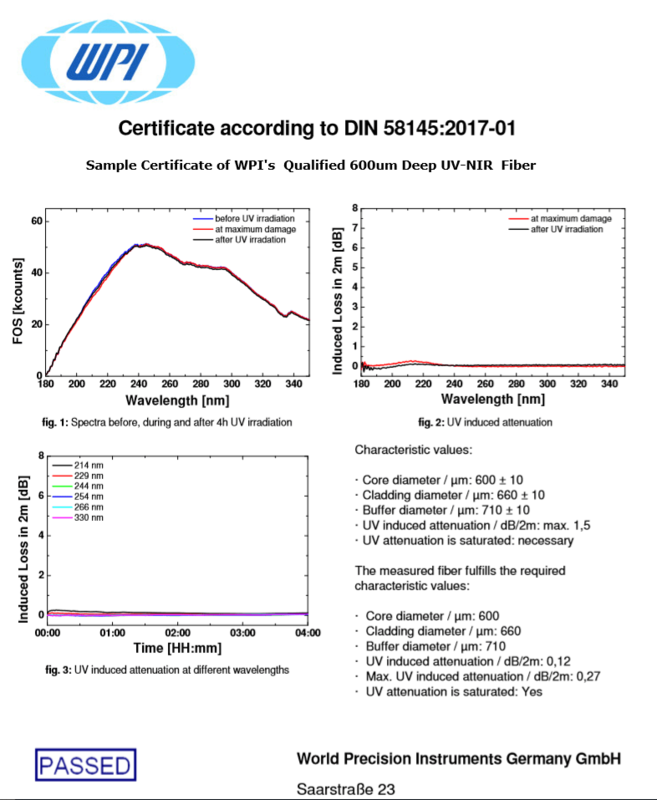 WPI is the only company offering DIN 58145:2018-01 certified low solarization UV fiber and assemblies.